Lisa El-Ramey, Robert Shorr and Laura Danowski take the oath of office. 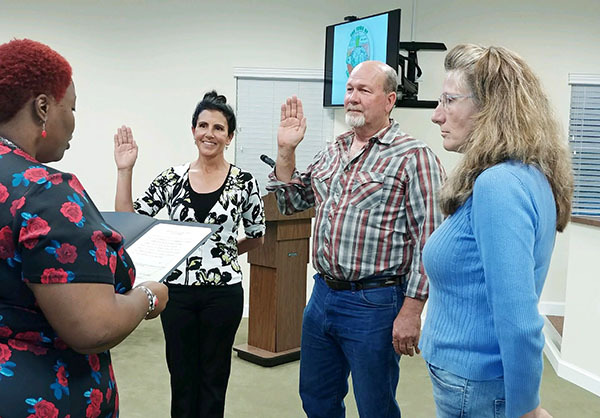 Loxahatchee Groves swore-in three new council members Tuesday, March 19 amid congratulations from residents and admonitions to resolve issues in the town, including longstanding road woes and settling differences with the Palm Beach County Sheriff’s Office. Laura Danowski, Lisa El-Ramey and Robert Shorr took the dais, replacing Mayor Dave Browning, Vice Mayor Todd McLendon and Councilwoman Anita Kane. Once seated, Councilman Dave DeMarois was tapped as mayor pro temp, while Shorr was picked as vice mayor pro temp. The annual appointment of the mayor and vice mayor will be made at the council’s next meeting on April 2. Newly hired Town Manager Jamie Titcomb, sitting at his first meeting, pulled several items from the agenda that he said needed further review before going to council discussion. During public comment, McLendon congratulated the new council members. He also noted another $3 million in transportation grants in the works, $8 million that voters approved for road improvements and new road maintenance equipment. Former Councilman Dr. Bill Louda congratulated both the outgoing and new council members, especially Browning, who served as mayor since the town’s incorporation. Planning & Zoning Committee Chair Dennis Lipp, also a former council member, recommended that the new members read the town charter. Former Councilwoman Marge Herzog said she hoped for a good year with anticipated funding and grants. “With everything that’s promised to come in, it should be a very productive year, and next year’s budget should be a lot better than this year’s is,” she said. Herzog encouraged the new council members to take the government studies classes offered by the Florida League of Cities. Herzog also encouraged new council members to participate in an ethics seminar that will be conducted by Town Attorney Michael Cirullo, as well as attend the next Loxahatchee Groves Landowners’ Association meeting on Thursday, March 28 at 7 p.m. at Palms West Presbyterian Church, where an expert will speak about agricultural classifications. Community Emergency Response Team member Ken Johnson invited council members and the town manager to attend the next CERT meeting on Thursday, April 4 at 7 p.m. at Palms West Presbyterian Church. 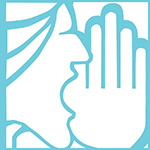 Johnson noted that council members are elected to protect the citizens of Loxahatchee Groves. Johnson also encouraged council members to look at resolutions that have been passed and determine which ones need to be kept or not. “There’s some things on the books that have never been enforced,” he noted. Johnson added that council members should develop a vision for the future of the town. “We need to have a future vision as to where we are going to be in one year, five years and 10 years out,” he said. Resident Paul Coleman questioned why the preliminary reading of an item pertaining to the contract with the Palm Beach County Sheriff’s Office had been postponed. “I hope this doesn’t become something that just gets pushed and pushed,” he said. Finance Advisory & Audit Committee Member Connie Bell encouraged council members to serve all residents equally. Bell added that some people do not live on lettered roads but pay gas tax money, yet some of the roads get no attention for months at a time. She also said that more attention needs to be paid to lost business tax revenue. Next articleI Have A Treadmill… Now I Just Have To Use It!